Juice Factory — Mobers.ORG — Your Daily Source For Mobile FUN! The assembly line is rolling. Lights are flashing. Juice bottles and fresh fruits are coming out from the assembly line. The supervisor is grumpy. Your job is to make as many juice bottles as you can, move the bottles into the juice cases, and get them shipped out of the factory. Simply the best and most additive sorting game in the market with stunning graphics and exciting game play. 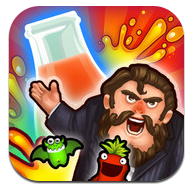 The game is universal app that supports iPhone, iPod touch, and iPad. It supports the OpenFeint with Leaderboards and Achievements - total of 16 achievements to collect. Also available on Windows Phone 7 Marketplace and will come to Google Play soon.